I returned from Connecticut just in time for my first tomatoes. This is the plant that I bought at the Home and Garden Show back in March. It had a bit of a setback at first when a pest chewed completely through the stem, forcing it to sprout a new one, but it's producing wonderfully now. I'm rather amazed at how big some of those tomatoes are getting. megory gave a tour of my garden to the two guys (brothers) working on my kitchen, and they asked to have one of the tomatoes for seed-saving, because it reminded them of tomatoes they used to have long ago and had never been able to find since. We wound up giving them one each, since there are plenty left anyway. While I was on vacation, my dad occupied himself by making a new hanging light for my front porch. I think he did an outstanding job. 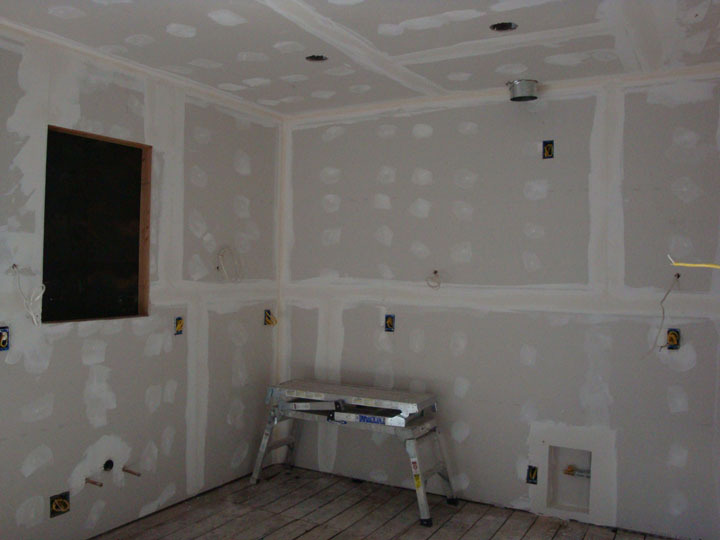 Once the inspection of my kitchen was completed on Monday, the workers were able to make good progress. 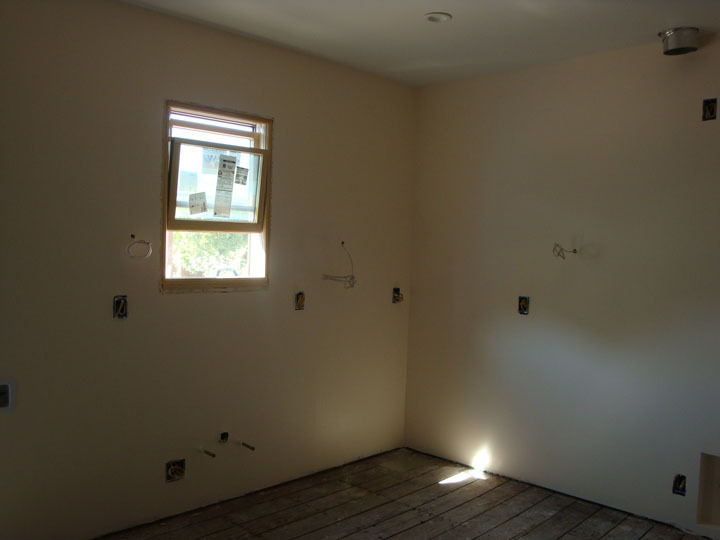 By Wednesday, the drywall had been put up, and by Friday the window had been installed. After that, it's up to my dad to do the rest. First he tackled the painting, which helps make the room look habitable rather than a disaster area. The next step will be to install the flooring. I also had to order a new door, because current building code requires a fire-rated door leading to the garage. It's an expense that I hadn't anticipated, but at least the new one is going to look much more stylish than the old one. What a difference in the kitchen! It should move along quickly now. It should move along quickly now. I hope so! I also heard from the cabinet maker that everything is ready except the range hood. The cabinets will then need to be stained, varnished, and installed. But at least the end is in sight! Love those tomatoes! We started getting tomatoes last week. Small ones, but better than none! We started getting tomatoes last week. Nice! It's definitely the season for them. Your father is amazing. The new porch lamp is beautiful, and how awesome to have someone who cares painting your kitchen. I'm glad the kitchen remodel is going so well. It's fascinating to see all the connecty bits waiting for the appliances they connect to. I agree! I'm absolutely blown away by everything he accomplishes. It's fascinating to see all the connecty bits waiting for the appliances they connect to. Yeah, kinda neat to see the function behind all the form. 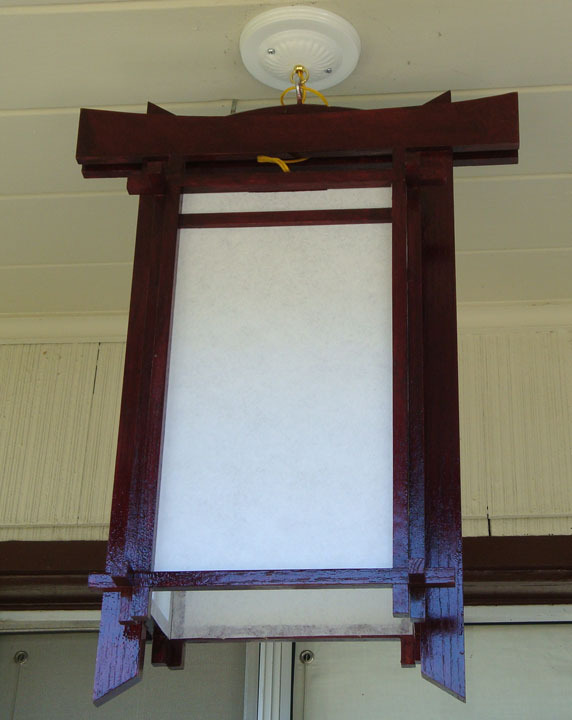 Oh, the lantern was for the porch. It looks amazing! I'm jealous of your tomatoes--since we lost our first plantings to the tree disaster, ours are all still tiny and green. since we lost our first plantings to the tree disaster, ours are all still tiny and green. Awww. 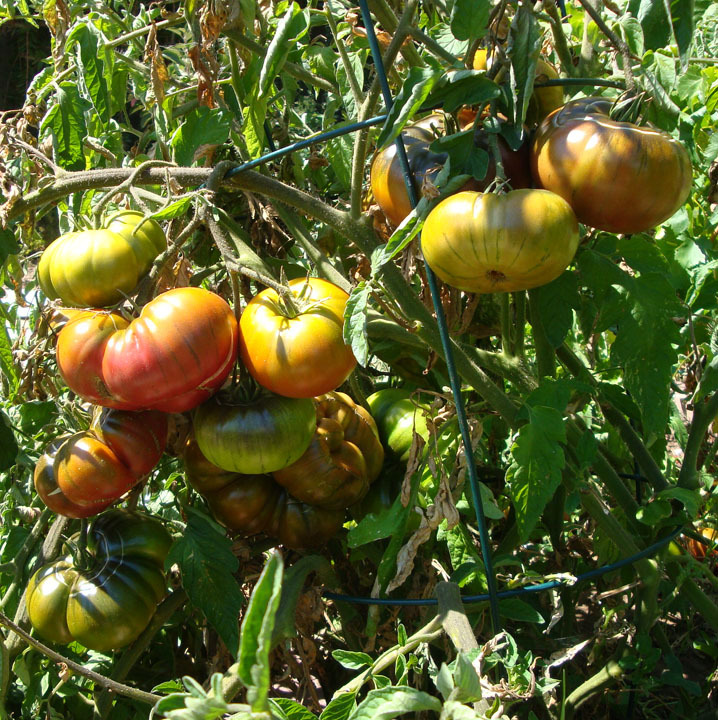 Hopefully you have enough summer left for them to ripen up. The ones I planted that were damaged by slugs while young are just now flowering. I know the plants will live until December, though, so I'm pretty sure I'll get something from them. Yeah, that's doubtful here. Though it's possible, if we have a very mild fall. We actually still have a few unplanted seedlings and I'm thinking we should put them in pots and bring them inside once it starts freezing. The idea of having fresh tomatoes in the winter is pretty appealing.